Creative is designed meticulously to give your site a modern and clean look. Built with Bootstrap 3, HTML5, CSS3 and K2, it is easy to install and flexibly customizable. Creative goes with multiple layouts for your preview: Boxed and Wide layout, Dark and Light skin, Masonry and Classic Blog layout, With Sidebar and Fullwidth layout. You are enabled to create your splendid and fully functional website with various premade shortcodes and lots of useful extensions built in: United Revolution Slider 2, JUX Portfolio, Noo Gallery, Noo Maps, Noo Tabs and AcyMailing. 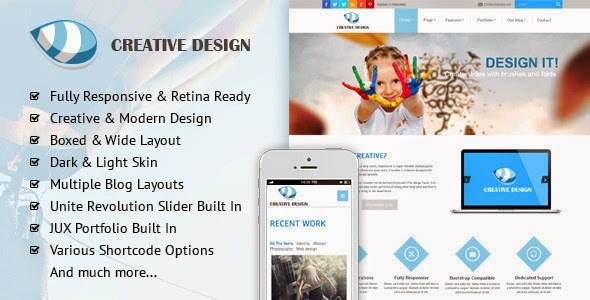 Creative is the great idea for a responsive corporate and business website Joomla Template. Item Reviewed: Creative Responsive Corporate Joomla Template 9 out of 10 based on 10 ratings. 9 user reviews.